REDMOND, WA—Touting the new gameplay features available in the upcoming fifth title in the popular fighting series, Nintendo reportedly revealed Wednesday that Super Smash Bros. Ultimate will allow characters to repeatedly punch themselves in the face to freak out their opponent. 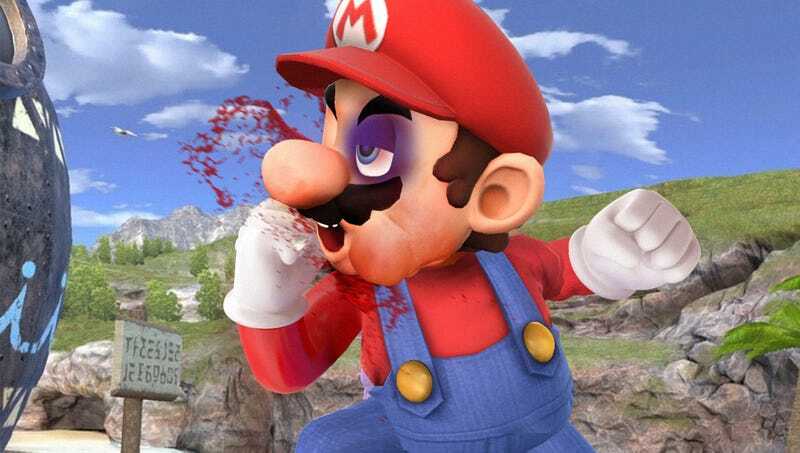 “The new Smash Bros. will be the most exciting iteration yet, with five new fighters, 103 battle stages, and thrilling combos that allow characters to steadily beat themselves to a bloody pulp while their adversary slowly backs away in horror,” said game designer Masahiro Sakurai in a press conference where he played a teaser video of a grinning Luigi relentlessly striking himself in the face over and over again until his eyes were swollen shut and his bloody mouth was filled with broken teeth, showing the audience how the move temporarily stunned his opponent, Pikachu, who looked on in terror as its psychological damage accumulated. “There are some differences, of course, among your favorite characters, whether that’s Falco grimly lowering his head before charging into a brick wall, slowly getting up, and doing it again, or Link calmly slicing open his own arm with his sword while maintaining eye contact with his unnerved opponent. Our new characters will also be able to scare their foes shitless, like Castlevania’s Simon Belmont, who can hand his whip to his challenger and beg them to lash him with it. Then there are some powerful new items, such as the lit cigarette a character can pick up and jab into their own flesh while they manically cackle.” At press time, there was already widespread concern growing among eSports players that the new combinations would simply be too powerful.